Looking for the best restaurant in Las Vegas? Pop Up Pizza bakes up delicious pies using only the freshest ingredients. Located in the newly remodeled Plaza Hotel in downtown Las Vegas, our pizzas are made with fresh ingredients, homemade tomato sauce, and a delicious golden crust that’s baked to perfection. Pizzas are sold by the pie or by the slice, and you can also snack on other delicious menu items like salads, a selection of beers, wines, and sodas, and vegan ice cream for dessert. The Soho – Our vegan pizza is comprised of vegan mozzarella cheese, spinach, artichoke, mushrooms, and roasted bell peppers. We are located at 1 South Main Street in downtown Vegas, and are open daily from 11 am to 2 am. We deliver! 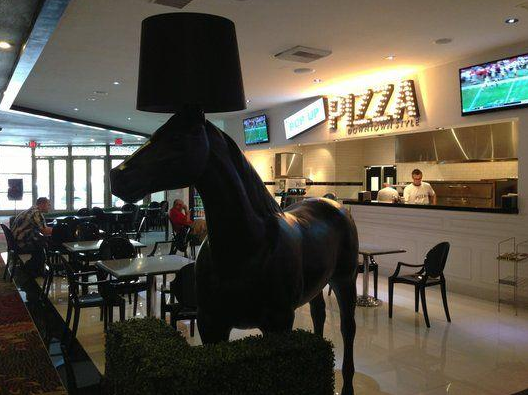 Contact us online or give us a call at (702) 366-0049, or visit our cozy dining space for delicious downtown-style pizza.